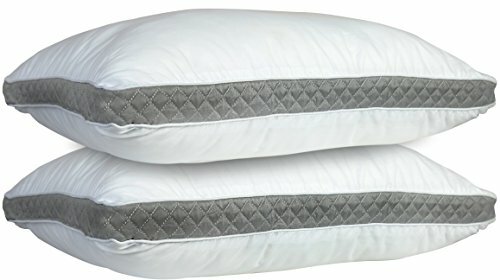 Optimal Size and Stitching: Pack of 2 White Microfiber Pillows with Grey Gussets and pipping. High quality double stitching to improve durability. Queen Size 18 by 26 inches. High Quality: 100% brushed Microfiber material filled with 100% virgin polyester 7D hollow siliconized filling that provides optimal level of comfort. Healthy Lifestyle: Pillows are allergen and chemical free. They are also Hypoallergenic and resistant to dust mites. Satisfaction Guaranteed: If for any reason you decide that this Pillow set is not of the quality, all you have to do is send a simple email and receive a 100% money-back refund, with Return label.